It’s a heartbreaking and sadly predictable dating experience: you’ve met someone you’re really into, and he seems into you too! Then suddenly – and completely without warning – he mysteriously pulls back (or disappears altogether) after a few “great” days together or a few weeks of “exclusive” dating. You are heartbroken! What happened? Why did he pull away? And just when things were really getting good! 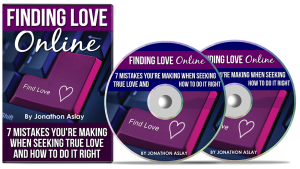 If you are ready to put a “cease and desist” order on this frustrating and painful dating situation, then the time is NOW for you to order this two-part audio program. How to know a “Flight Risk” when you meet him. The spoken and unspoken signs that he’s planning his escape. What you may be doing that is inadvertently pushing him away. How to know if he’s really ready to get and stay close. The secrets that will have him wanting to Get Close and Stay Close – to YOU! Plus, you’ll receive more than $280 of valuable bonus recordings to help you better understand men and what makes them act as they do. Has it been difficult for you to find a good, desirable man who isn’t in some way commitment-phobic or afraid of love? Men can be difficult to understand. Dating can feel like a crazy-making endeavor. Why, for example, will a man say one thing (“I’m really into you”) but do another (not call for days and days, or ignore your text messages)? How to spot a commitment-ready man, and the kind of man that you should avoid at all costs. The seven psychological “triggers” that make a man want to commit to a woman. What men REALLY want in a relationship…it’s probably not what you think. What it really means when a man acts flaky, distant, stand-offish or suddenly turns cold, and how YOU should handle it. Bonus eBook & audio: The Relationships Men Commit to and Why – Find out if your relationship is going to go the distance. Bonus Workbooks: Relationship Ready Man Tests – Is he really ready for a relationship? Bonus Recording: His Hero’s Journey to Commitment – Why (and how) men screw up and what it means for the future of your relationship. Bonus Recording: Attract Men Who Don’t Need Fixing – Stop getting stuck with men who are broken and start attracting who are ready and able to commit. Bonus Recording: 5 Keys to Unlocking His Heart – Discover the simple keys that will trigger love and commitment in any man. Quickly and easily magnetize the man of your dreams online by learning how to create a profile he can’t resist and applying specific techniques to separate the high-quality man who shares your values from duds, perverts and scammers. When it comes to meeting Mr. Right, the Internet is the place to be. According to recent studies, close to a third of couples who married within the last decade met online. They’re also slightly less likely to divorce than couples who first met face-to-face. Then you need this audio course. Click the link below to find out more.